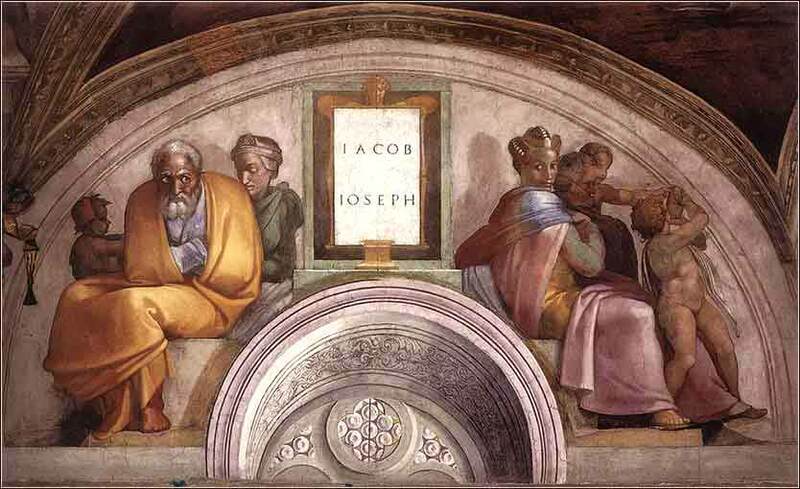 "Jacob and Joseph" from The Ancestors of Christ, fresco in the Sistine Chapel, Michelangelo c. 1512. Notice Joseph's Egyptian hair style and lack of a beard. "Joseph Interprets Pharaoh's Dreams", illustration from The History of Joseph and His Brethren by Owen Jones, 1869. Courage does not always roar. Sometimes it is a quiet voice at the end of the day, saying,"I will try again tomorrow." These are the names of the sons of Israel who came to Egypt with Jacob, each with his household: Reuben, Simeon, Levi, and Judah, Issachar, Zebulun, and Benjamin, Dan and Naphtali, Gad and Asher. All the descendants of Jacob were seventy persons; Joseph was already in Egypt. Then Joseph died, and all his brothers and all that generation. But the people of Israel were fruitful and increased greatly; they multiplied and grew exceedingly strong, so that the land was filled with them. By popular vote, we take up our Bible study where we left off in mid-November. Our last verses were the final verses of Genesis, ending the story of Joseph with a few words about his last years and his death at the age of 110. The age of the three Hebrew patriarchs — Abraham, Isaac, and Jacob (also named "Israel") — has ended. But God has made a promise to them: that their line would become a mighty nation as numerous as the grains of sand in the desert (or the stars in the sky) and that He would give them Canaan as their land. Once Jacob moved to Egypt with his twelve sons and their families, the inheritance of this promise through a single patriarch ended. Although the Hebrews are a single nation, there is no longer a single leader. But as a nation, they keep the name of the last patriarch, Israel (Jacob). Both Abraham and Isaac had had other sons, and they sometimes founded great tribes, but they are not inheritors of God's promise. Most notably, Ishmael married an Egyptian woman and, according to a majority of Christian, Jewish, and Islamic scholars, his descendants became the Arabs. Esau also founded a nation, Edom, which lived in a large arid region south of the Dead Sea and survived primarily by trade; they will frequently come into conflict with the Hebrews later on. But it was the children of Jacob with whom God had His covenant. We do not know exactly how long a period of time the first few verses of Exodus represents, but it was certainly centuries, most likely 300-400 years. 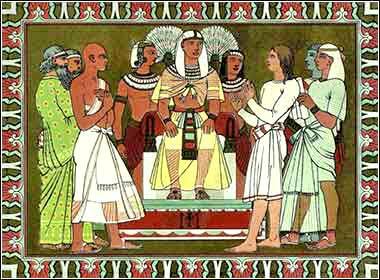 Pharaoh had given Joseph extensive lands in the east of the Nile delta to act as Egypt's shepherds and herders, for this activity was anathema to the Egyptians and the Jews were thus unclean to them. This served to insulate Israel from outside corruption, either cultural or genetic, as it grew; they spoke their own language, worshiped their God, and married among themselves. They were successful, and became increasingly wealthy and numerous. Their social isolation served as a cultural incubator for the fledgling tribes, until they had the size and means to become a mature nation unto themselves.